Shoot your coconuts straight and true to collect them in the basket, but beware the monkey magic that might monkey with you. Coconuts is a great game for a younger audience that likes things a little hands on. This game uses fun components and has a great theme to it. 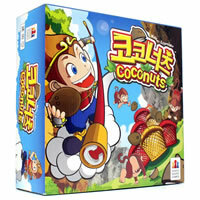 The game Coconuts is a great game for adults or siblings to play with younger kids. See how well you can shoot your coconuts. Game play is quick and learning how to play is a breeze. Give this game a try and buy your copy today. The winner is the player with the most coconuts. Included are 4 launchers, 4 player boards, 14 cups, 36 coconuts, 12 magic cards and the official Coconuts game rules and instructions. Please keep in mind that the official Coconuts childrens rules and instructions could be different depending on the game version you have. The rules below are some of the exact directions on how to play Coconuts. Share with us your comments, funny stories, tips, advice, strategies, creative ways to play, questions about how to play, problems with the rules or anything you want about Coconuts. All submissions will be reviewed within 24 hours. Click here to add your Coconuts comments.